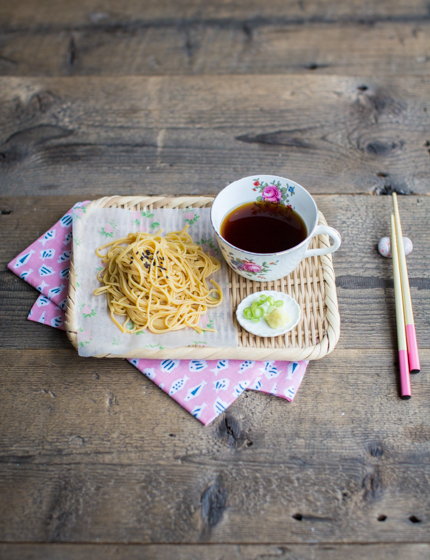 It might sound strange at first – cold noodles?! But hear me out. This is in fact a very traditional Japanese dish, and one that may surprise you in its deliciousness. 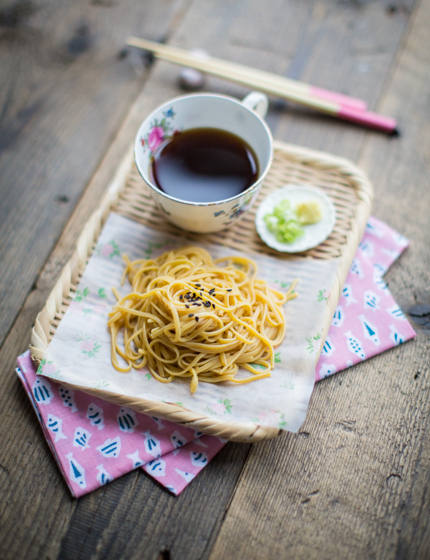 Soba noodles are first cooked, then cooled under a running tap and often served with ice cubes – to keep them fresh and prevent them from sticking together. The silky noodles are then dipped into a cold smoky broth to add flavour. It’s a very refreshing summer dish, but if you want it more hearty, you could do it like the Japanese and eat these with hot tempura – a hot and cold combination which works really well. 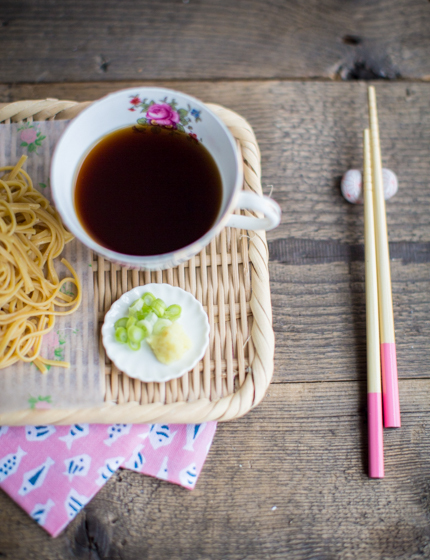 By the way, soba noodles are made from buckwheat flour, and are thus gluten-free. You might notice that the noodles I’ve used in my photos are not as grey as comon soba noodles, but more golden-coloured – that’s because I used up a packet soba noodles from my local organic shop, made with pumpkin and ginger, which obviously affected the noodles’ colour. Also, don’t be afraid by the mysterious ingredients. You can get them all from Asian stores or order them online. Put the bonito flakes, soy sauce, mirin and water into a small saucepan and bring to the boil. Boil for 2 minutes, then reduce the heat and leave to simmer for another 2 minutes. Strain the liquid through a sieve and leave to cool completely then refrigerate for at least half an hour to get it really cool. For the soba noodles: bring a large saucepan of water to the boil, add the soba noodles and simmer over a medium heat for about 5 minutes until al dente. Drain, but keep half the cooking water, putting it into a teapot and keep it warm. Rinse the soba noodles with cold water until cooled. Finely slice the spring onion and put onto a little serving dish with half a teaspoon of ginger. 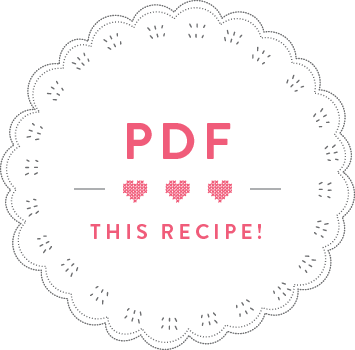 Divide the dipping sauce between two small bowls, place the noodles on the side and sprinkle with a few sesame seeds for decoration. Put a bit of the ginger and spring onion into the dipping sauce, adjusting the taste to your liking. 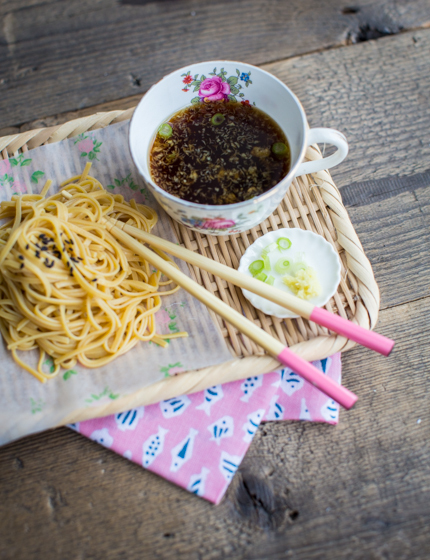 Pick up a few soba noodles with chopsticks and dip the ends into the dipping sauce before eating. Once all the noodles have been eaten, pour the warm soba noodle cooking water into the remaining dipping sauce, and eat this as a soup to finish your meal. 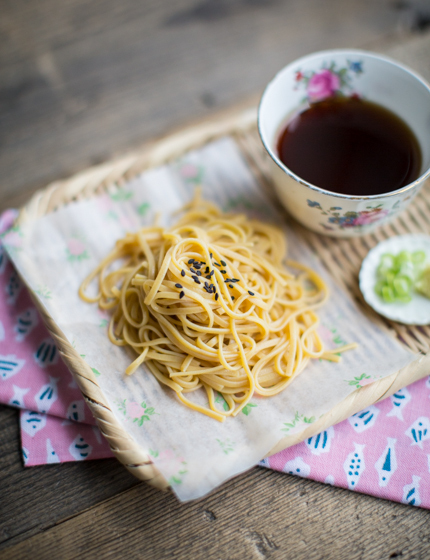 TIP: If the soba noodles stick together, put them back under a running tap, toss with your hands and serve immediately.